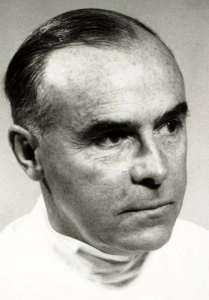 Professor Lucius Rüedi delivered his Semon Lecture on the 6th of November 1958 at the Royal Society of Medicine. Through this, he outlines the histology of the larynx, common sites of pathologies, and the process of regeneration after injury or illness. He also showed a high speed video countering Georges Portmann’s clonic theory by demonstrating that air flow is necessary to cause vibrations. Lucius Rüedi was born on the 2nd of December 1900 in Thusis, Switzerland. As well as being an eminent clinician, he also carried out a lot of research into areas such as cholesteatomas and chronic otitis media. He was a member of both national and international scientific communities and was elected as President of Collegium Oto-Rhino-Laryngologicum Amicitiae Sacrum.